6 stylishly practical ways to accomodate more guests than you'd planned for at the dinner table. In cases where you need to squeeze more than just a couple of additional guests, a few loose chairs will certainly go a long way. We’d suggest opting for chairs like our exclusive Oliver Outdoor Crossbacks that offer up classic styling in a lightweight UV plastic that’s easy to move around. Mix and match your crockery and cutlery to make it feel "on purpose"
If you find you've got more people than you do plates in your good cutlery set, get creative and mix up your sets for a mix and match feel that will make for easy entertaining and which can look quite novel too. Give the children their own dining table near to the adults for a fun way to make more space. Better still, get them to decorate their own table and you’ll have one less thing to do. If indoor and patio space is limited, consider spilling over into the garden. If the weather is good, why not bring a couch or two outdoors to create a spontaneous open air lounge, or lay down an outdoor rug and scatter cushions on the lawn for a super relaxed entertainment area. Benches offer just that much extra space to squeeze one extra person into the mix at the table. They also spell easy, relaxed dining, helping to take the pressure off you. 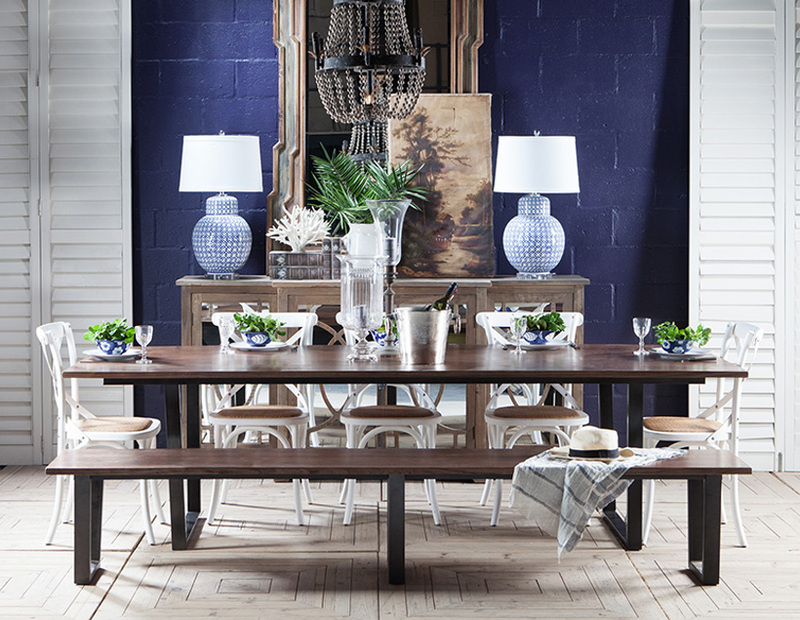 With iron legs and a wooden top, our Kube bench can function as a great dinner table seating option. Let people fix their own drinks to help free you up for other more pressing tasks. Set up a drinks station complete with glasses, plenty of ice and of course, a variety of drink options and encourage everyone to fill up their glass whenever they need. The gorgeous Shanghai drinks cabinet is a great option to help you organise your refreshment station stylishly.